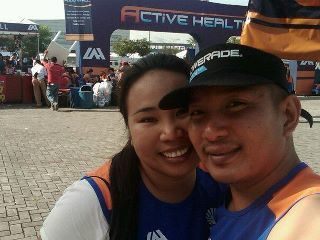 Last Sunday March 4 me and my hubby, once again joined the Unilab's annual running event. We haven't hesitate to join, be it at SM Mall of Asia because for the last years it was held at BGC which is a walking distance to our place. Despite the distance and not running for almost a year, no one can stop us from running and we will start it with a bang so we joined the Run United 1. We woke up around 5AM and ready for the run, since I prepared all the things that we need a night before, my hubby had all his needed matters for the run as well as mine. He drove all the way to SM-MoA and I am very excited too. When we where there, we saw familiar faces and joined them for some stretching and warm-ups.The time has come and we hold our hands at the starting line, Im so happy that I begin to run again and motivate also to loose my weight for a very special reason (baby). I am so impressed with the improvement of Run United organizers, firstly there are plenty of portalets, ushers and marshals scattered around the area. Secondly, the Unilab Active Health Expo was organized and line-up properly, thirdly the program and awarding started early and lastly they was a WiFi connection and U-Connect section which you can use for 5 mins. Of course there were some flaws like the usual plastic cups scattered around the race area, the poos of the doggies also, and lighting on some race areas specially for 21K participants. 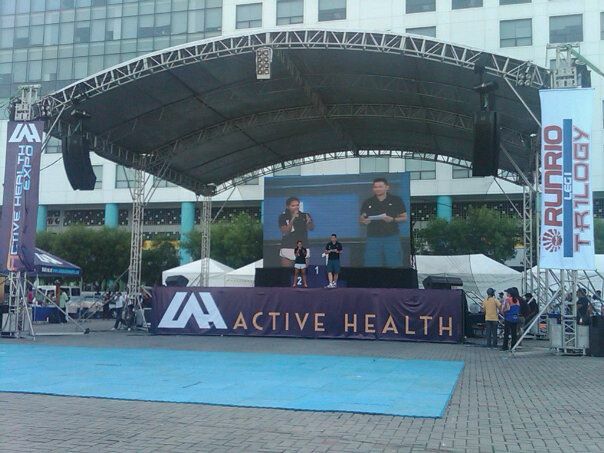 For more updates and announcements like them on Facebook www.facebook.com/UnilabActiveHealth and visit their website www.unilabactivehealth.com. yup sis, im with my hubby, we just started again kaya 3KM muna hayz, more practice and run to increase it by RU2 hehe...See yah..